July 4th means different things to different people. But for the folks in Atlanta, Independence Day always begins with a bang courtesy of The Peachtree Road Race. Started back in 1970, the race originally featured 110 runners. It’s gotten a bit larger over the years. It now reigns as the biggest 10K in the entire world with a field of around 60,000 participants. This year’s edition featured 57,170 finishers with winning times of 28:25 in the men’s division, 32:16 in the women’s division, 20:30 for the men’s wheelchair division and 23:17 for the women’s wheelchair division (some very very fast athletes). An additional twist this year had Boston Marathon winner Meb Keflezighi starting dead last in an attempt to see how many people he could pass as a way to raise money for charity (FYI, he passed over 22,500 people). Registration costs for the general public for the 2014 Peachtree Road Race ran $38 (plus fees), which is quite reasonable. A few years ago the race switched from a “first come first served” process to a lottery system (capped at 60,000 runners). The odds are very good that you’ll get in. As for the race expo, it was held this year at The Georgia World Congress Center. Parking for the expo is $10, but you can download a voucher from the website that will knock it down to $6. It’s a sizable expo with plenty of vendors or at least that’s what I heard. This year I opted to have my bib mailed to me ahead of time for a few extra dollars, which saved me having to deal with a lengthy round trip drive downtown (in pre-holiday traffic). With 60,000 runners, thousands of race workers/volunteers and approximately 150,000 spectators, The Peachtree Road Race is a citywide affair… an extremely crowded citywide affair. Driving to the start of the Peachtree Road Race is probably not your wisest choice given the congestion and street closures (and the fact that it’s a point-to-point race). If you’re not getting dropped off by friends/family, your best option is probably to take the train (MARTA) to the start. Stations are located all around town and a round trip pass will only set you back $5.50. And on race day MARTA runs extra trains and provides additional workers to sell passes. I parked near the Perimeter Mall and took the red line train to the Buckhead station. After that it was just about 10-minute walk to the start area (with plenty of volunteers and porta potties along the way). American Idol, but with shirts! 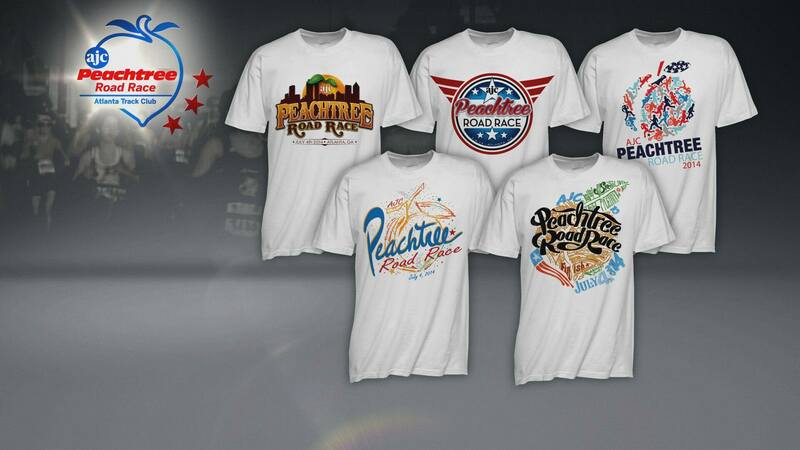 Each year, The Peachtree Road Race holds a contest where runners pick the look of the final shirt from a pool of five finalists. The winning design is kept secret and revealed to the participants when they finish the race… a very fun tradition. This year’s winner was a fun and colorful “peach design” (big surprise there) but the outline of the peach was made up of a roadmap of the race route through Atlanta. The shirt itself was white (color varies each year…sometimes good, sometimes bad) and also a cotton shirt as opposed to a tech T-shirt. There have been discussions about the Peachtree going to a tech shirt, but as of yet it’s still just talk. 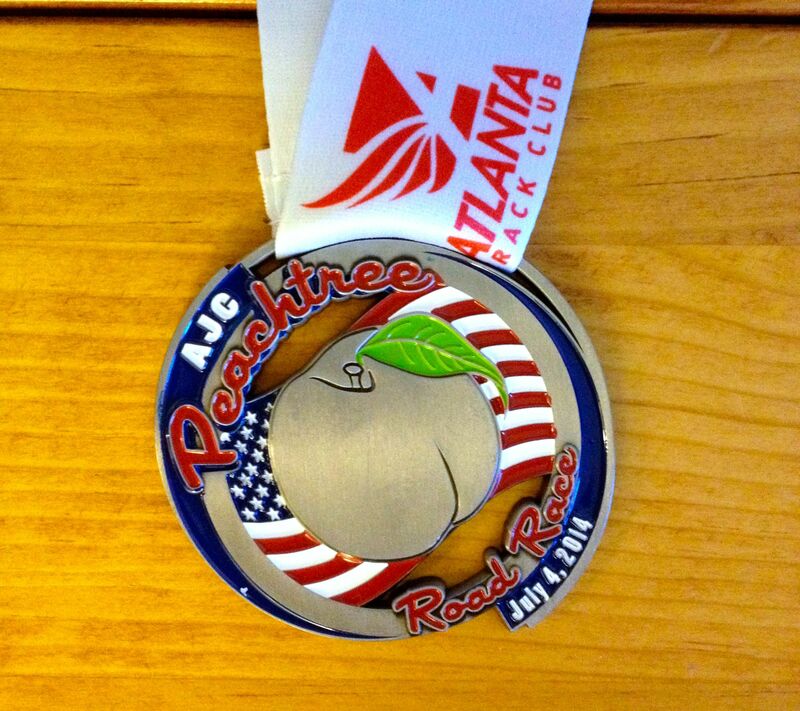 The race doesn’t give out finisher’s medals, but runners have the option of purchasing a Peachtree medal for around $12. Since this was the 20th anniversary of my first time running the race, I opted to buy the medal and it’s a nice “patriotic” peach design (featuring some red, white and blue). The Peachtree Road Race is a “point to point” 10K course starting at the Lenox Mall, traveling mostly along Peachtree Rd. (lots of peaches in Atlanta). The race itself takes you through the lively Buckhead area, where several of the bars and restaurants have opened early and patrons are there drink in hand to cheer you on. It also winds near Midtown, before turning onto 10th St. and ending at Piedmont Park. I hope you like hills, as the Peachtree Road Race has more than its fair share. Good news at the start as the first three miles feature a nice downhill slope, allowing you to save some energy and go at a faster pace. But what goes down, must come up apparently, as around the 3-mile mark you encounter the ominously named “Cardiac Hill,” an upward slope that goes on for almost a mile (and flattens out near Piedmont Hospital). The remainder of the course vacillates between flat ground and rolling hills (favoring the “up”). One nice note is that the race does end on a favorable downward slope so you can pick up your pace and use up that last bit of energy while you wave to spectators and try to act like you’re not exhausted. And speaking of exhaustion, one other thing worth noting about the Peachtree Road Race is the weather. 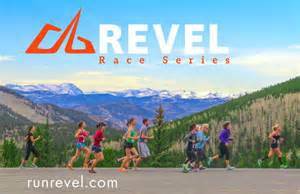 Summer running is challenging for most runners and the weather conditions definitely come into play for this race. July 4th in Atlanta can be a hot and very humid experience with raceday temperatures often in the 70s- 80s and with high humidity. Add to the fact that it takes a long time to get all of the runners over the start line (first group at 7:30am and the last group gets off shortly after 9:00am), and you definitely need to prepare for warm conditions. The Peachtree Road Race definitely exemplifies the notion of “southern hospitality” as the support for the race is excellent. I’ve been to smaller races where things are unorganized and utterly chaotic, yet the Peachtree coordinates 60,000 runners with ease (other races should send representatives to check it out). From start to finish, pretty much everything about the race is smooth sailing. Plenty of porta potties at the start area and oodles of volunteers herding the running masses. Along the course you can find well-manned water stops at every mile. In addition, plenty of spectators, businesses and charity groups line the course offering everything like: water, ice pops, oranges, cold towels, sweatbands and beer (tempting, but I passed). Mile markers are present along the course although they didn’t have digital timers nearby, so best you bring a GPS watch. I saw plenty of medical personnel on the sidelines of the course and fortunately this year the cooler weather meant fewer people in need of aid. One other thing worth applauding is the crowd support. Atlanta loves its Peachtree Road Race and they show it by coming out en masse. Spectators crowd both sides of the road from start to finish and it’s a great feeling to see all of those happy faces dressed for the 4th of July supporting their country, city and all of the runners. The crowd alone makes the Peachtree one of my favorite races to run. Running with 59,999 of your closest friends. The southern hospitality I just mentioned definitely continues at the finish line. After you complete the race, you make your way into Piedmont Park where you’re handed a bottle of water and a goody bag with your race T-shirt (you pick the size by getting in the appropriate line) and a few freebie coupons (like a free waffle at Waffle House). And then you take that bag into the main area where it’s snack time. Vendors like Coca Cola and Publix are on hand giving out more food than you can shake a stick at: Powerade, coke products, ice cream sandwiches (yum), bagels, bananas, cookies, pretzels, granola bars and much much more. My only complaint is that some runners and their families act like its a free-for-all and stock up on way too much food (taking home bags of it) and not leaving enough for everyone. I did hear this year that some of the runners at the back of the pack were shortchanged on food and shirts (something I’m sure the race will fix in time for next year). And then it’s time to meet up with your family and start the trek home. I say “trek” because if you took MARTA, you’re facing a good 15-20-minute walk to get back to the nearest MARTA station. It’s the part of the race that I like least, but there really isn’t much the race can do about it. After you run the race the first time, you’re prepared for the post race walk (call it a cool down) and can spend your time in transit chowing down on the aforementioned goodies. 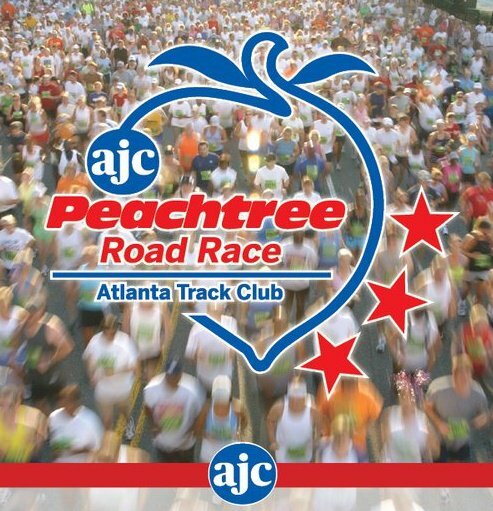 Running The Peachtree Road Race has become a semi-annual tradition for me (10 times in the last 20 years) and one of the races I absolutely look forward to running. On the years I’m not able to make it Atlanta for the race I feel that my Independence Day is somehow missing something. The race is steeped in tradition and it’s an event that the entire city gets behind to support. And while the weather can definitely be a wildcard, and fast times are not the norm due to the heat, humidity and hills (although I did PR this year), The Peachtree Road Race is a wonderful experience and as close to a “destination race” 10K as you can get. Posted on July 8, 2014, in General, Race Review and tagged Peachtree Road Race. Bookmark the permalink. 4 Comments. I think that was the most thorough review I’ve ever read 🙂 I never knew it was the biggest 10k in the world! 60,000 runners is a LOT. Thanks for the kudos on the review. It really is a massive race, taking over an hour to get everyone across the start line. When I crossed the finish line there were still thousands of runners who hadn’t even started running. A really fun time and a race I highly recommend. Great post – very informative! I lived in ATL for three years and I never got to do the race – I think I missed out! Thanks for the comment. My family lives in ATL, so I get to do double duty for the holiday… running and BBQ. If you get back to Peach City in the future, you’ll have to give it a run.